Prominent & Leading Exporter from Nagpur, we offer doxyclyine hcl, fluka tablet, forcan-200, terbinafine cream, forcan tablets and fluconazole tablets. We are the Leading suppliers of Doxyclyine HCL. We also do Drop Shipping of Doxyclyine HCL. Forcan tablets 200mg are also used to prevent fungal infections like cryptococcal disease in immunocompromised patients and to prevent recurrent vaginal candidiasis. Forcan 200 tablets contain fluconazole 200mg, a broad-spectrum antifungal drug belonging to the triazole group of antifungals that is a potent and specific inhibitor of fungal enzymes necessary for the synthesis of ergosterol, an important component of fungal cell membrane that is not found in animal cells. Fluconazole in Forcan tablets 200mg weakens the fungal cell membrane, causing the cell contents to leak out which kills the fungus, preventing the infection from spreading and relieving symptoms caused by the infection, including, itching and inflammation. Forcan tablets 200mg contain fluconazole, a broad-spectrum antifungal drug, used to treat and prevent a variety of fungal infections. Relieving itching, burning, cracking, and scaling associated with jock itch, athlete's foot, ringworm, and other fungal infections of the skin. Terbinafine cream is topical antifungal agent. It works by killing sensitive fungi. Some MEDICINES MAY INTERACT with terbinafine cream. Because little, if any, of terbinafine cream is absorbed into the blood, the risk of it interacting with another medicine is low.Ask your health care provider if terbinafine cream may interact with other medicines that you take. Check with your health care provider before you start, stop, or change the dose of any medicine. Forcan tablets 200mg are also used to prevent fungal infections like cryptococcal disease in immunocompromised patients and to prevent recurrent vaginal candidiasis. Forcan 200 tablets contain fluconazole 200mg, a broad-spectrum antifungal drug belonging to the triazole group of antifungals that is a potent and specific inhibitor of fungal enzymes necessary for the synthesis of ergosterol, an important component of fungal cell membrane that is not found in animal cells. Fluconazole in Forcan tablets 200mg weakens the fungal cell membrane, causing the cell contents to leak out which kills the fungus, preventing the infection from spreading and relieving symptoms caused by the infection, including, itching and inflammation. If you are taking the liquid suspension form of this medication, shake the bottle well. Fluconazole is an antifungal medication that is administered orally or intravenously. It is used to treat a variety of fungal infections, especially Candida infections of the ("yeast infections'), mouth, throat, and bloodstream. It is also used to prevent infections in people with weak immune systems, including those with neutropenia due to cancer chemotherapy, transplant patients, and premature babies. Its mechanism of action involves interfering with synthesis of the fungal cell membrane. Fluconazole single-dose tablets are an azole antifungal. It kills sensitive fungi by interfering with the formation of the fungal cell membrane and weakening it. This may not be a complete list of all interactions that may occur. Ask your health care provider if fluconazole single-dose tablets may interact with other medicines that you take. Check with your health care provider before you start, stop, or change the dose of any medicine. We are the Leading suppliers of Zybiraa 250mg Tablets. 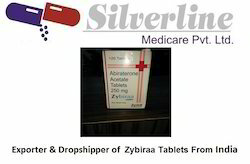 We also do Drop Shipping of Zybiraa 250mg Tablets. We are the Leading suppliers of Suminat 100mg Tablet. 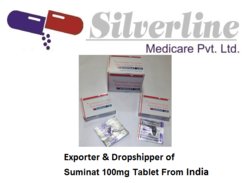 We also do Drop Shipping of Suminat 100mg Tablet. We are the Leading suppliers of Candid B cream. We also do Drop shipping of Candid Cream. Looking for Antifungal Medicines ?